Is The No-Fly List A Punishment Tool? I really appreciate Evan asking me to do a guest blog. I work from home 4 days a week, and as an early riser, I’m on the computer between 5 and 5:30 a.m. each morning. I usually turn on the TV to watch “Anderson Cooper 360” on CNN. The Thursday show had a story about reporter Drew Lewis, who found himself on the Transportation Security Administration’s (TSA) No-Fly list, coincidentally, right after he did an investigation about the lack of air marshals on U.S. flights. I’m not a conspiracy theory, grassy knoll type of girl, but my crap detector went off after hearing this particular story. Lewis is an investigative reporter for CNN, so any reasonable person would have to think that he travels pretty regularly. He then does what could be seen as a negative story on TSA. Then all of a sudden, he finds out he’s on the No-Fly list? TSA says that “any connection between Griffin’s reporting and his name being added to the no-fly list is absolutely fabricated.” Ok, but it just doesn’t smell right to me. And Drew Lewis is not the only one. Sen. Ted Kennedy (D-Mass.) has been on the list, and Rep. John Lewis (D-Ga.) – one of the guiding lights of the Civil Rights movement – can’t get his name off the list. The CNN story said that Homeland Security Secretary Michael Chertoff testified before Congress last week and said he would be “happy” to help Lewis in his efforts to get removed from the list. That’s nice, but one, why is his name on the list in the first place and two, what about all the people who don’t have direct access to Mr. Chertoff to get their name off the list? Just last week, the ACLU held a press conference to recognize the 1 millionth name added to the No-Fly list, which we covered July 15 in Aviation Daily (subscribers only). Meanwhile, TSA has been delaying the implementation of Secure Flight, its computerized airline passenger screening program, since announcing its creation back in 2004. The last we reported was by then end of this year, but it doesn’t look like that deadline will be met. One of my favorite television shows is “Boston Legal” on ABC. The Jan. 16, 2007, episode, entitled “Nuts,” featured a case where uberlawyer Denny Crane (played memorably by the legendary William Shatner) was unable to take a romantic trip to Hawaii with his midget girlfriend’s mother (never mind — it would take WAY too long to explain) because he had been put on the No-Fly list. Crane asks Alan Shore (played by James Spader) to try and settle the issue with an official from TSA, who tells them that it takes a pile of paperwork and an “indefinite” amount of time to be removed from the list. So Crane asks Shore to represent him in a lawsuit against the government to be removed from the list. The government argued that the list was necessary in the wake of the 9/11 attacks and the ongoing war on terror. They apologized that some people are inconvenienced, but said it was the price that had to be paid for security. Shore pointed out U.S. policy that keeps some terrorists off the no-fly list in order not to tip their hand, but that ordinary, non-threatening, law-abiding American citizens remain on the list, potentially forever. I thought his closing was brilliant, and I’ve posted some of it, below. Some of the new iPods, you can load up to twenty thousand songs on them… The technology in this country is staggering! And yet, the government can’t get their computers to erase my client from the No-Fly list. Even though they admit he shouldn’t be on it. Instead, nobody named Denny Crane can fly. Now! Mr. Winchell is correct, he doesn’t need me to indict Homeland Security, the 9/11 commission already did that… I’m sure Tom Ridge is a nice man, capable too, as is Michael Chertoff. Jets can not only fly by computer, but they can now take off and land on auto pilot. Should we truly be stumped by this No-Fly computer list? How about something as simple as issuing a flyer’s license? It could have your picture, fingerprints, you show it, scan the card and your fingers at the gate, if it’s a match you get your aisle seat! This can’t be undoable. Expensive? Maybe. But judging from recent spending patterns we’ve got billions to throw around. Halliburton alone has profited ten billion from the war, maybe we could get them to kick in. Is it really against national security to think outside the box? This isn’t about beating up on Homeland Security. Everybody knows they’re trying, I’m sure they’re good people, but they simply cannot dispatch a representative to this courtroom to say the problem isn’t fixable, while thousands of Americans are being denied due process. It so easily has to be fixable. And in the meantime my client sits here today, a law-abiding man, grounded! I’m a law-and-order type of girl and I know that we live in a world where many people want to do bad things to our citizens because we’re American. But is it really that hard to cull the No-Fly List to remove law-abiding citizens who happen to be misfortunate enough to have the name of an actual terrorist? Aren’t we the nation that sent a man to the moon? I know, that’s weird, right? 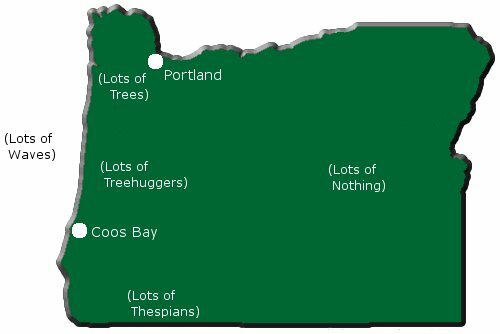 People don’t think of Coos Bay and North Bend very often. And to be honest, when I first heard the name, I had to look it up on a map despite having family in Portland. So that you don’t have to do the same, here it is in all its glory, with just a little bit of editorializing. I chose to write about Coos Bay, because one of my readers mentioned that my blog had been brought up on an episode of Think Out Loud, a program from Oregon Public Broadcasting. If you find this topic interesting, I’d recommend heading over and listening to all 52 minutes of the program. The main topic was the loss of air service in Oregon. They mentioned my blog because of an old post of mine expressing my opposition to the Essential Air Service program. This program was a very interesting look at several issues regarding Oregon’s shrinking air service, but I thought it was interesting to focus on the issues facing Coos Bay and North Bend. The Bay Area lies along the Pacific, a “mere” 222 mile drive from Portland. According to Google Maps, that’ll take you a good 4 hours and 3 minutes. Up until this summer, service was relatively consistent. Portland saw year-round connectivity, and there was often summer service to Seattle. It probably wouldn’t surprise anyone to see that Horizon’s service was rapidly becoming less and less viable. Why? I imagine that Horizon was just aching for a way to get out, but it’s not that simple. The government doesn’t allow the last airline serving an airport to pull out without permission. So, Horizon would have had to file 90 days notice so that the government could try to find a replacement. “Try” is a key piece of this, but in this case, Horizon got lucky before they even filed the notice. On June 27, SkyWest (operating as United Express) announced it would start twice daily service down to the real Bay Area (San Francisco), 500+ miles to the south, on July 7. That same day, Horizon filed with the government to stop its 3 to 4 daily flights to Portland (PDF) on October 11. So for now, Coos Bay/North Bend has mixed feelings. They’re going to miss their more frequent Portland connection, but they do now have service to San Francisco. But what happens next? SkyWest is slowly phasing out its 30 seat Brasilias. How will it be replaced? And if it doesn’t make financial sense, then how can they end this service? It’s a very sticky situation when it comes to service to smaller communities. Essential Air Service subsidies can help with some areas, but now even larger ones that could support some subsidy-free service are feeling the pain. With fuel prices where they are, things aren’t going to get easier. If you’re a small airport, your #1 goal should be to keep user costs low, because that’s your best bet to maintain service. But now, even low airport costs aren’t enough to guarantee service. The government is going to have to take a long look at how small community air service is going to be handled in the future, because the current model isn’t working. [A]t congested airports like London/Heathrow or Frankfurt, the airlines don’t have slot flexibility so I assumed they’d have to just change around their flights in the US. But what about when that involves flights at New York/JFK or Chicago/O’Hare, also congested airports? This gets very tricky and the result is a hodgepodge of schedule changes for some airlines. . . .
Look at JFK, however, and the London flights change both their US departure and arrival times. As you can imagine, arriving into the US an hour later means missed connections and longer waits for the next flight.